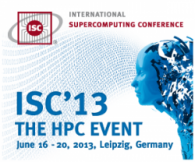 Meet hpc-ch at the ISC13 conference (booth #747)! Advance registration at reduced rates is now open for the 2013 International Supercomputing Conference. ISC’13 will be held June 16-20 in the historical city of Leipzig. By registering now, ISC’13 attendees can save over 25 percent off the onsite registration rates at the Congress Center Leipzig. Combine this discount with the improvements and additions to this year’s program and there is even more incentive now for planning to attend ISC’13. The comprehensive program consists of half and full-day tutorials, a 4-day conference track, 2-day industry tracks, and 3-day exhibition featuring dynamic exhibits from leading HPC companies and research organizations. A number of workshops and satellite events will also complement this year’s program. Attendees will be able to tailor their registration to meet their interests and schedule, thanks to a flexible passport and pricing system. Participants can register for either the entire program, selected events, or just specific days. Check out all the different passports* and the fees structure here ». ISC’13, the 28th conference in the series, is expected to draw 2,500 attendees from academia, research institutions and industry around the world. An estimated 170 leading organizations will showcase their products and research at the ISC exhibition.